TrustVeterans.com - A Veteran's Take: First flight as a civilian. A U.S. Army UH-60 Black Hawk helicopter from the 1-149th Aviation Brigade flies over Houston, Tx on Feb. 5. 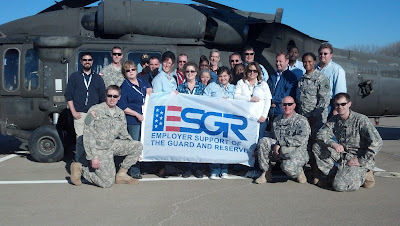 I was invited to attend an "Employer Support of the Guard and Reserve" visit to Fort Hood, Tx. My company not only does VA Loans, but we also employ Veterans and their family members. We care. Not because of the bottom line, but because it's the right thing to do. Many times today, I was surrounded by business executives that had only recently hired a Veteran. Never served themselves, or some that even had no family or friends that served. "They just work Steve", I was told by a couple of the different employers. A Veteran comes to the civilian world with a different set of life experiences than a person who follows a traditional path. Not to say that a traditional path is wrong, or better, or worse. It's just different. Private employers stand with employees who are also in the U.S. Army National Guard. Some would even say that joining the military is a traditional path, but I would disagree with that statement. My line of reasoning is that less than one percent of the entire American population has served in the military. How traditional is that compared with the number of college going Americans? To give you a small idea, according to the U.S. Census Bureau, the number of Americans who hold Doctoral degrees is around three percent. Compared to 1% who serve in the Armed Forces. Today was filled with stories from employers who had great soldiers, serving honorably, and preparing to deploy. I was privileged enough to meet with a group of these soldiers and they were eager to show me what their duties consisted of as members of an attack aviation brigade. 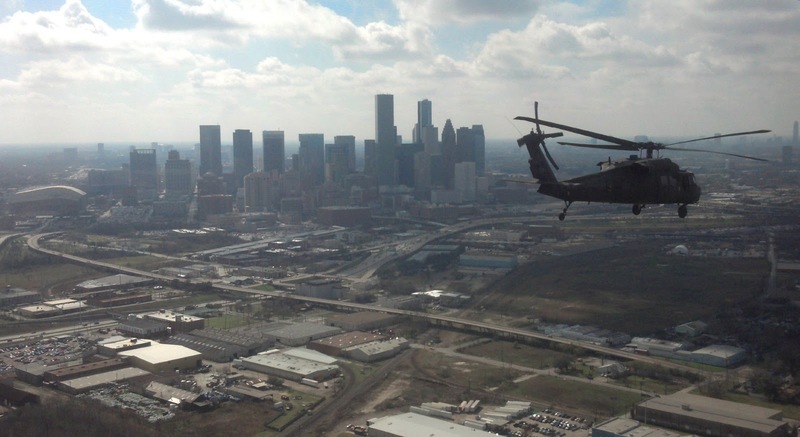 All of them were either pilots, maintainers, or crew members on UH-60 Black Hawks, CH-47 Chinooks, or AH-64 Apaches. These brave young soldiers are all National Guard members about to embark on a nine month deployment to Afghanistan. Many of them, for the first time. I felt a great sense of pride when speaking with this group of Americans. All of whom wear their uniform's proudly, but also, all of whom are "civilian soldiers." They work for oil companies, auto repair warehouses, and finance conglomerates. They are just your next door neighbor. Picking up the morning paper, mowing the lawn and driving the kids to school. But they have a team stronger than any a corporation can match. The U.S. military. It was an honor to meet my neighbors, quietly serving their country, and being productive members of society while at home. I can't wait to hire a few more of them myself.